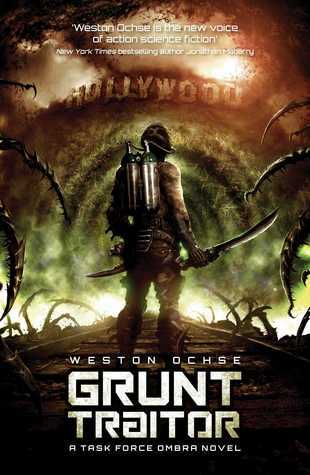 I didn’t realize that Grunt Traitor, by Weston Ochse, was a follow-up to another novel (or book two in a series), and I expect that there’s a lot of information in the first book that would be good to have, but I don’t think it’s crucial to read and enjoy (‘enjoy’ isn’t maybe the right word) this novel. Grunt Traitor takes on a popular sci-fi theme – that of humans fighting off aliens who are looking to take over the earth. But what this book does is pick on the front line guys, the grunts, instead of the Hollywood super-star who manages to save the day in the movies. And because it focuses on the grunts, we also get a look at an issue that many soldiers face .. PTSD. The action takes place in California, much of it in the Los Angeles area. Ochse’s writing is so powerful that when Mason gets word of devastation in parts of the Los Angeles basin, I was moved by what was lost. I could picture the battle lines and the ferociousness of the fights with the aliens. It was exhausting just reading, and it helped to identify what Mason and other soldiers are going through (PTSD) and yet how they are wired (or trained) to get the job done; to save even just their little portion of ground. I am reminded a lot of the early (military) works of Joe Haldeman in that this is one of the few books I’ve read that manage to capture the intensity and ‘excitement’ of war without glorifying it. This is a very difficult thing to do. I would have liked a little more direction … to get a sense of where this was going, though the lack of such definitely played into the story of what it is like being a military grunt. Looking for a good book? Grunt Traitor, by Weston Ochse, is not for the faint of heart. It is a powerful narration of what it is like to be a frontline soldier in a battle to save the earth from an alien invasion.